Today is Bob Newhart's 84th birthday and we'd like to wish him many happy returns. 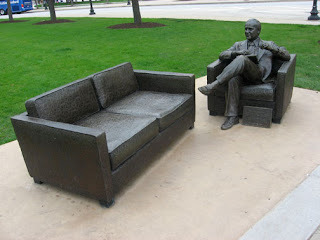 One of our all-time favorite eccentric roadside attractions is the Bob Newhart statue in Chicago (and you can read about it here). One of the best things Bob ever did was close out his Vermont-based sitcom "Newhart" by referring back to his previous sitcom "The Bob Newhart Show". We find out the entire series was dream when Bob wakes up in bed next to Suzanne Pleshette as Emily, making it, in our humble opinion, the best series finale in the history of TV. A youtube search reveals a little coda during the credits we had forgotten all about. Check it out here.